VERONA Radio Club Curaçao - Welcome to VERONA! Welcome to the VERONA Radio Club, Curaçao‘s amateur radio association. Member of IARU. Curaçao is an island of 444 km² size situated in the South Caribbean Sea, off the Venezuelan coast, and was the largest of the islands forming the former Netherlands Antilles. Since 10/10/2010, Curaçao is a constituent country of the Kingdom of the Netherlands. Official languages are Dutch and Papiamento, but English is widly spoken as well. VERONA is the country's IARU representative. The club was founded back in 1948. It has around 40 members, 25 of them living permanently on the island. Among other activies, we are active in emergency communication, be it on the lsland or helping elsewhere. 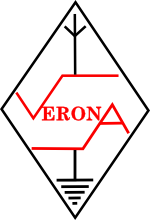 The name VERONA derived from its original dutch name "Vereniging Radio Onderzoek Nederlandse Antillen". After dissolution of the Netherlands Antilles, the name was kept. If you are a visiting amateur, visit our visitor‘s section for information on local services and meetings.